The Titan-T5 is a smaller portable computer enclosure from the Titan all-aluminum family. It is built to be rugged, expandable, upgradable and customizable with standard off-the-shelve components. 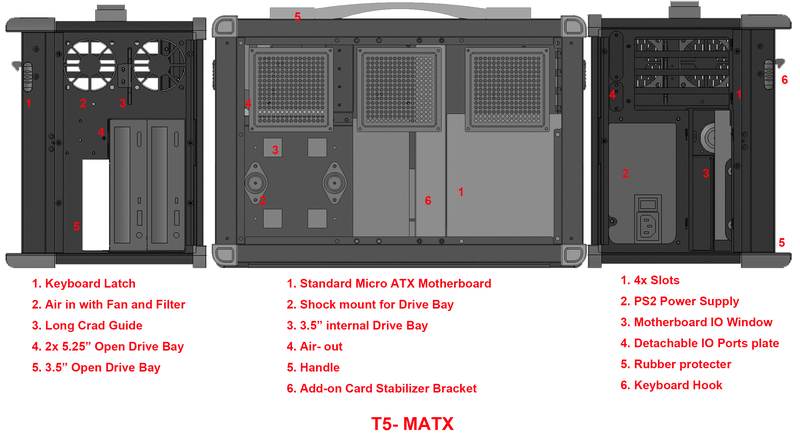 The T5 is available in both standard Micro-ATX or passive backplane form factor. Either models will support a wide range of processors from Intel and AMD which increases the product life cycle by not being obsolete in this fast changing industry. 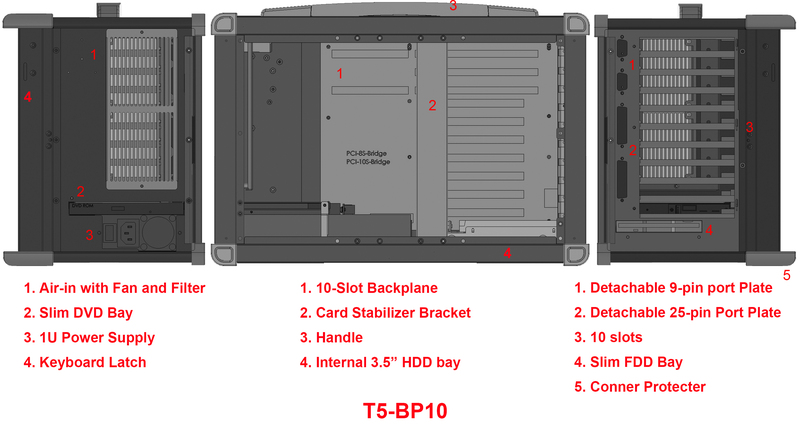 T5 has a double card retention system for double protection that holds individual add-on cards securely in two points, with an adjustable pressure mechanism. Now half and full length cards are always in place during transport. 15″ Active Matrix LCD with 3mm impact resistance glass protects the display from harsh and unfriendly environments. Two intake fans are efficiently placed to draw in fresh air blowing directly at the add-in cards. The enclosure was designed to allow air to flow through guided path then draw the warm air out from the exhaust fan in the power supply. The intake fans have a removable washable filter, which keeps dust and unwanted particles away from the system. PC 300W ATX type for the Micro-ATX model and 300W 1U industrial type for passive backplane model.